Since 1980, in order to spread awareness of ISSJ’s activities and to collect funds, ISSJ has held a charity movie event and a charity concert. The charity movie event happens twice a year, once in June and once in October. 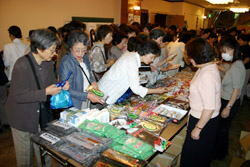 The charity movie event and bazar (sale) happen at the same time and place. The movie event and bazar is able to take place thanks to many different individuals, volunteers, companies, and organizations that participate. The money that is made during the event goes towards each subsidy program and projects that ISSJ supports. For example, some of the money goes towards helping institutionalized children seek opportunity for international adoption. It also provides money for children who were born without a nationality getting their nationality and returning to their country to be reunited with their families. Additionally, the funds help asylum seekers as well as other social welfare projects. We are looking forward to your participation and help! For the newest information, see "Charity Movie Information"
We are looking for volunteers to help the Charity Movie Festival and Bazaar. 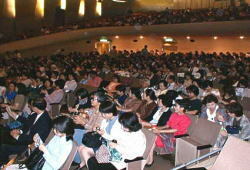 For further information, see "Volunteering"
ISSJ Charity Concert is held occasionally. For the newest information, see "Charity Concert Information"